Anson Hatch was born in Connecticut in 1823. 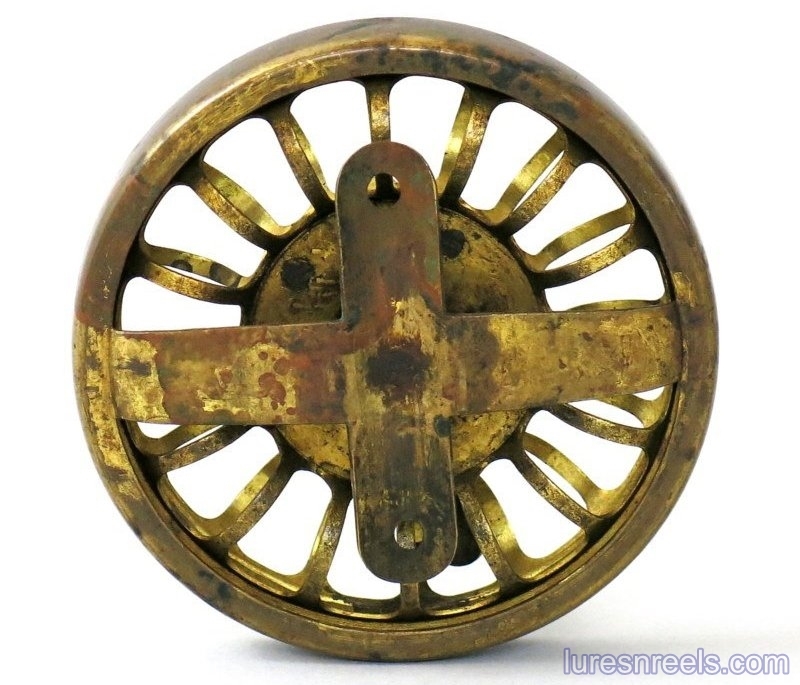 He was a Machinist by profession and an inventor. During his life, he received 7 patents. On February 12, 1856, Hatch was granted his first patent for a "Hand Press for Stamping Letters" while living in Forestville, CT. While living in Bristol, CT, he was co-inventor with two other men on November 17, 1857 for a "Machine for Turning Pillars for Clock-Movements." 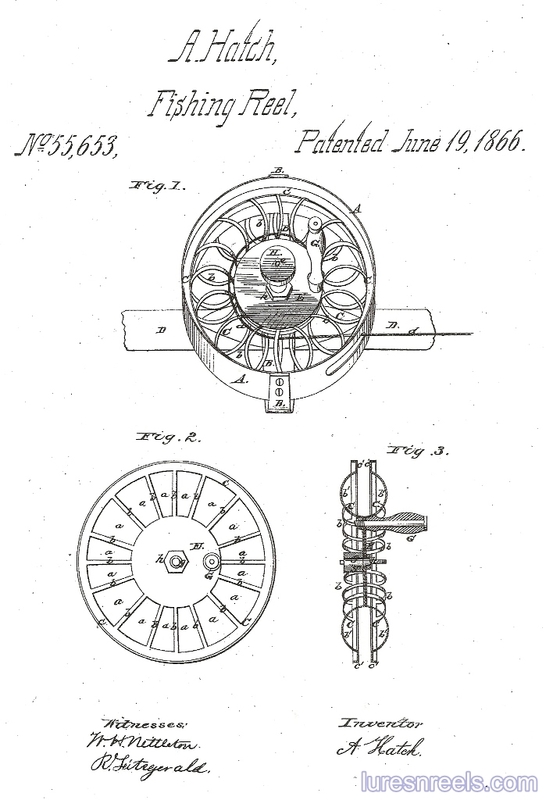 Then, while living in New Haven, CT, he received a patent on March 20, 1866 for "Improvement in Lathes." His last patent was granted on July 3, 1883. 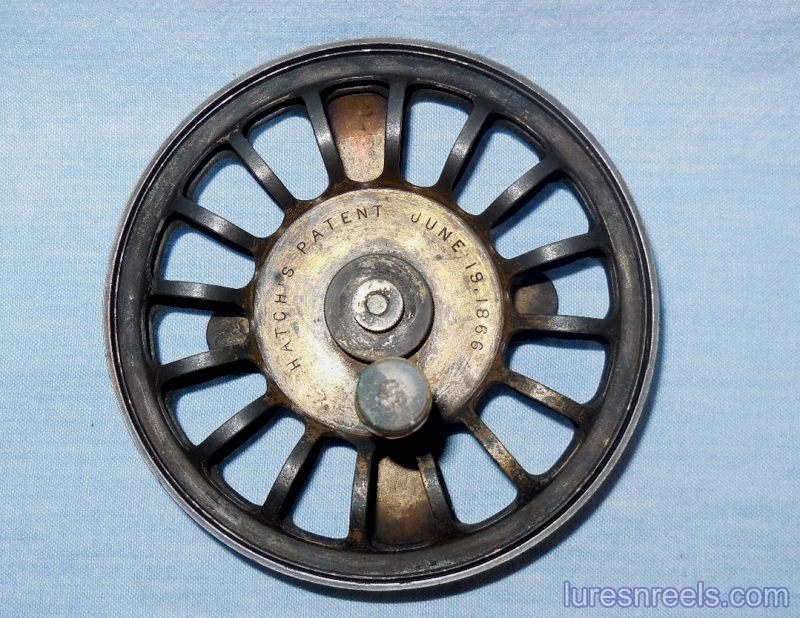 Hatch was 61 when he died on January 3, 1884 in New haven, CT.
His fourth patent is the one associated with his side-mount fishing reel that was granted on June 19, 1866. 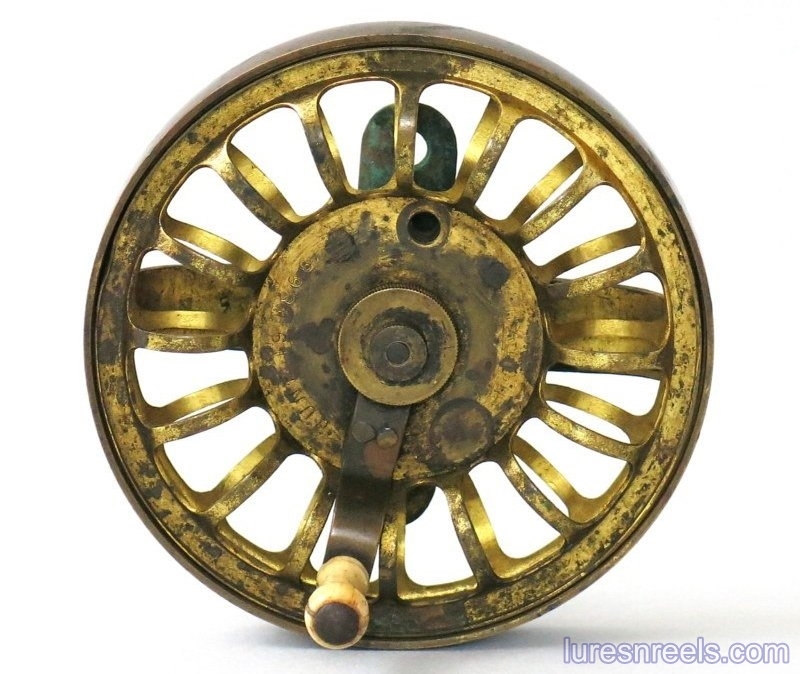 It's title is "Improvement in Fishing Reels." 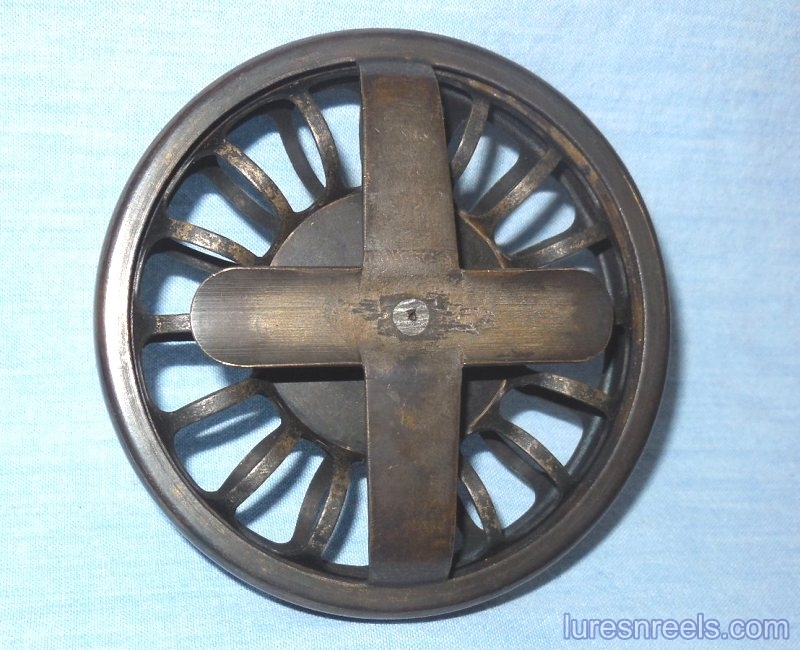 In the patent description, he states his design is an "improvement on that patented by W. Billinghurst August 9, 1859." 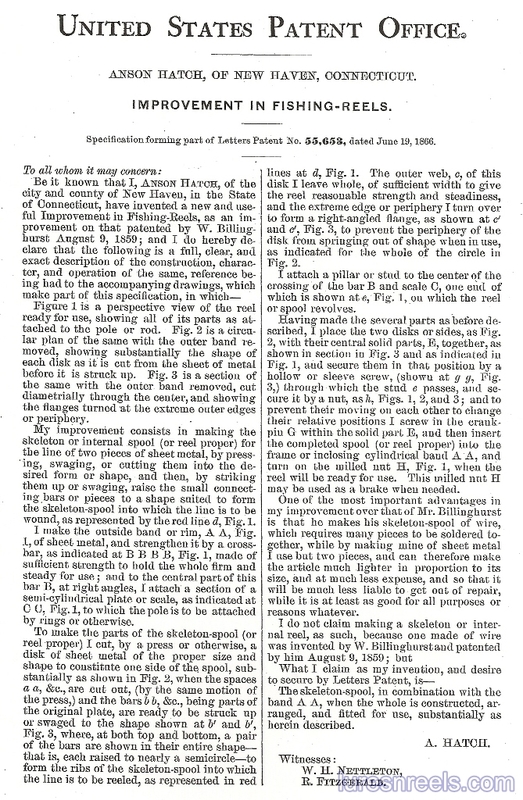 In the patent description he also states "One of the most important advantages in my improvement over that of Mr. Billinghurst is that he makes his skeleton-spool of wire, which requires many pieces to be soldered together, while by making mine of sheet metal I use but two pieces, and can therefore make the article much lighter, at much less expense and much less liable to get repair." 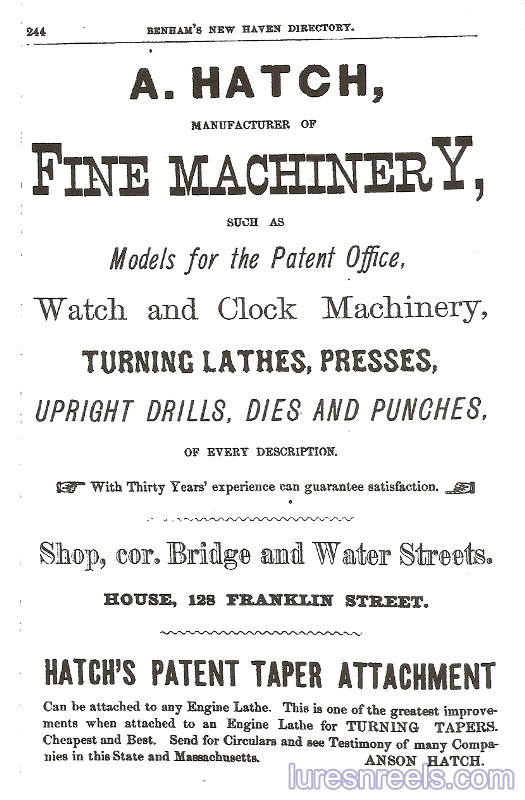 The City Directories for New Haven, CT in the 1860's thru 1880's list his profession as Machinist. 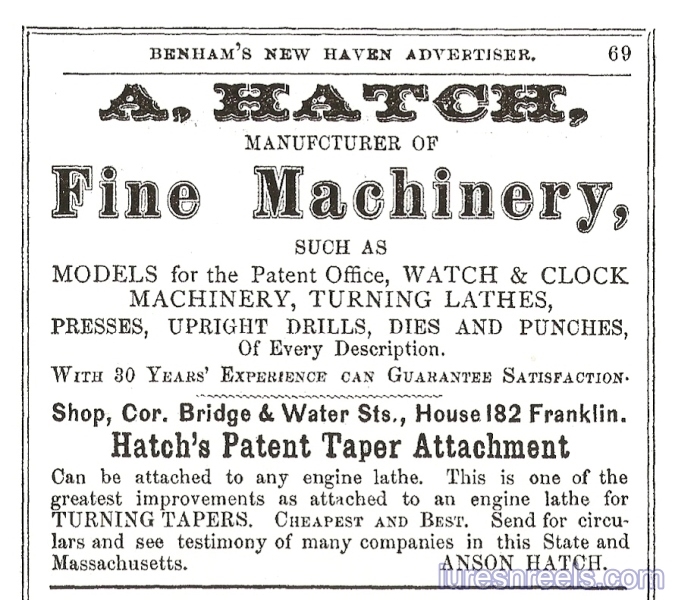 It was in 1870 when we see a marked increase in Hatch's advertising in the New Haven, CT City Directories. He now lists himself under three different categories as a "Patent Agent", an "Inventor" and as a "Manufacturer." 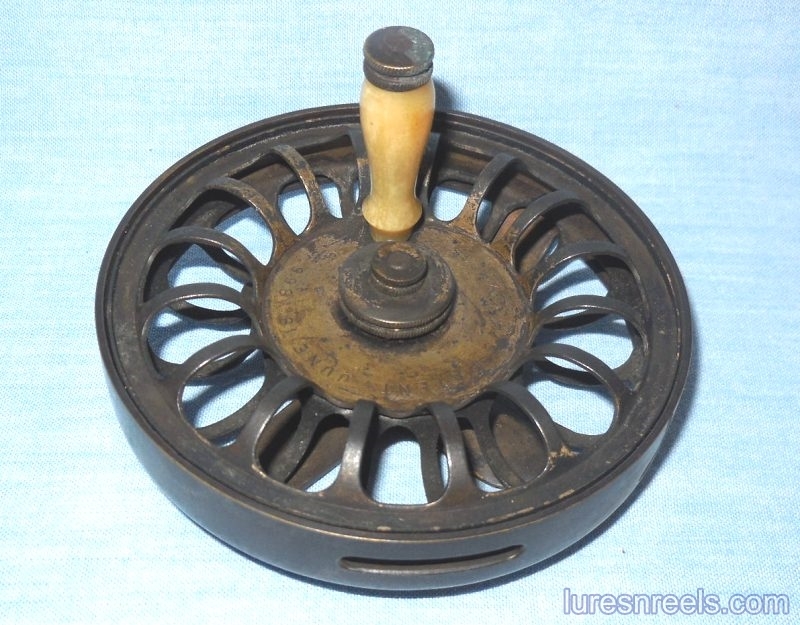 Sales of his fly reel must have added to his revenue to allow him to increase his advertising. Also, by this time he had received five patents and considered himself an inventor and patent agent and that made for good advertising. Anson Hatch received 7 patents in his lifetime. Below is a summary of the patent dates, patent numbers and patent titles. 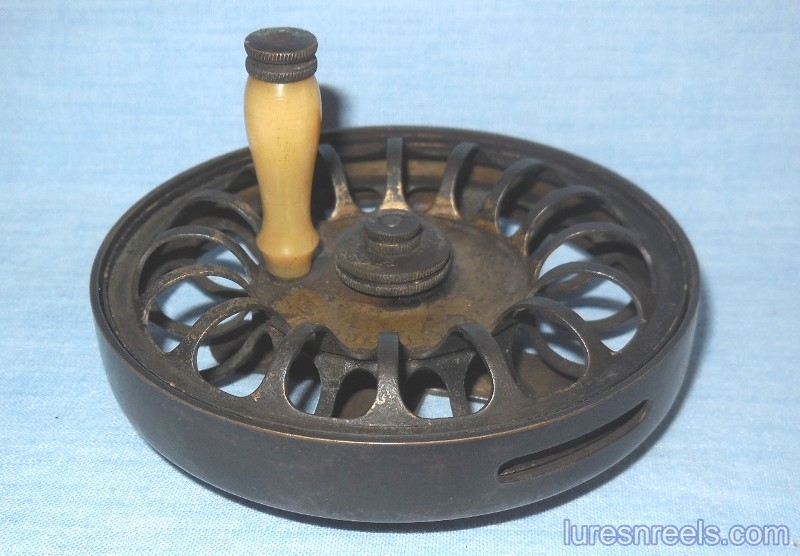 Feb 12, 1856 - 14,238 - Hand Press For Stamping Letters, Envelopes, Cards, etc.